Featured runners: Sabhajeet Yadav, Thomas Bobby Philip, Pervin Batliwala, Team Ladakh, Kamlya Bhagat, Idris Mohamed, Ravi Kalsi, Shyam Sunder, Amar Chauhan, Savio D’ Souza, Vaijayanti Ingawale and Dnyaneshwar Tidke. Scroll down to read what each one had to say. Sabhajeet Yadav: At the 2017 edition of the race, the farmer from Uttar Pradesh notched up his sixth consecutive victory in the full marathon, this time in the 60 to less than 65 years age category. “ I am always happy to run in Mumbai, this is the best event,’’ he said, when asked if the sultry, warm conditions of race day, which had been a dampener for many, had affected him. “ I didn’t find the weather oppressive. It was warm, yes. Two days earlier, when I arrived it was pleasantly cold, fine conditions for running. But the big difference this time was in me – I reached Mumbai after much preparation. I was averaging 200-250 km a week in my preparations back home. When you are well prepared, you are not upset by other difficulties like the weather on race day. I enjoyed my run, I even managed to have a pretty fast last kilometer-spurt,’’ he said. Sabhajeet thinks differently from other runners. As a farmer, his income from farming fluctuates. Farming in India depends a lot on the monsoon; a year of weak monsoon is bad for crops. 2015 for instance, had been a tough year in farming for him. Further earnings from farming usually get reinvested in farming. Running has been an alternative source of income. Prize money earned through running, helps cushion him and family amid the unreliable fortunes of farming. 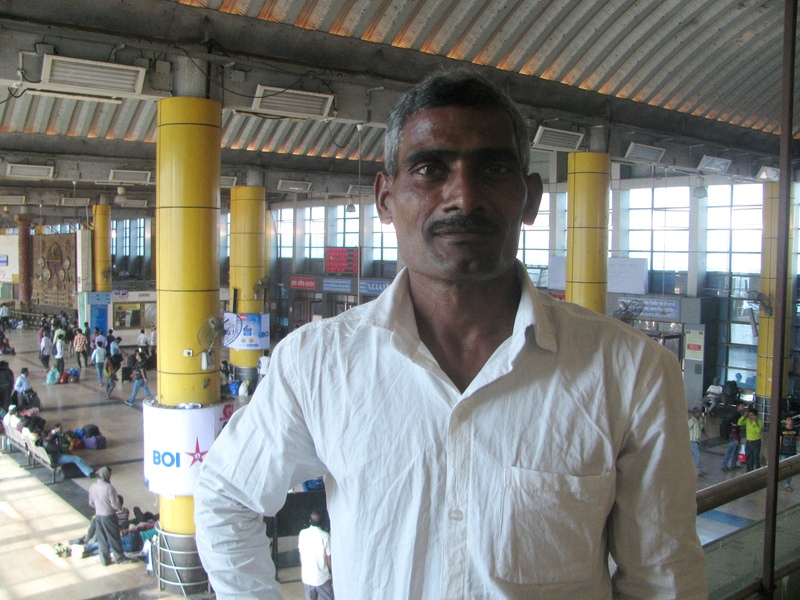 Imagining back from income, Sabhajeet has been evolving a matrix in his mind that seeks to match earnings to effort. According to him, the effort that goes into a competitive full marathon is much more than what goes into running a half marathon. Yet in races across India (he participates in quite a few), he finds that the disparity in effort is not adequately reflected in the disparity in prize money assigned for the full and the half. This being so, he wonders – isn’t the half marathon more value for effort? Consequently, he finds himself progressively partial to the half marathon. “ I am thinking of restricting my full marathons to Mumbai and Bengaluru,’’ he said. It is of course a different matter if in a given instance, the full is monetarily attractive. A quiet, unassuming person Sabhajeet is known to sleep at railway stations and race venues the night before a race, get up early next morning and win a competition. This time around in Mumbai, he stayed with his longstanding benefactor, Bhasker Desai. A veteran of many marathons, Bhasker has of late been favoring the half marathon and had therefore registered for that discipline at SCMM. These days the full and the half begin at opposing ends of the giant loop that is the marathon’s route in Mumbai. On the morning of the race, Bhasker said, Sabhajeet in characteristic style disturbed none, quietly took the train and proceeded to the full marathon’s start line. Hours later, a sixth win was in the bag with a timing of 3:24:35. Thomas Bobby Philip: This man did something truly remarkable at the 2017 SCMM. Running in the 50 to less than 55 years age category, he broke into sub-three hour realm in the full marathon finishing the 42 km long distance in two hours 58 minutes and 46 seconds. It was the first such instance for Bobby and while this blog is not informed enough to be sure about it – among rare instances, if any – of a sub-three reported by an amateur Indian runner of that age at a major marathon in India. Well known in India’s running circles, Bobby is a committed runner, born in Mumbai, living in Bengaluru. “ I had been training for it for the past one year,’’ he said, “ at the 2016 SCMM, I had completed the full marathon in 3:06:34. I knew that sub-three is possible as long as I ensure that I put in longer training and improve.’’ That effort has paid off. Bobby was coached by K.C. Kothandapani. “ A good coach is important,’’ Bobby said, pointing to the plan Kothandapani had given him. “ That’s one half, the rest is your commitment and mental strength,’’ he said. According to him, the first challenge was to maintain the timing he had returned at the 2016 edition of the race. After all, every improvement is on the back of an earlier performance maintained. Then, you have to come up with ideas on how to improve. In Bobby’s case, the emphasis was on strengthening, flexibility, intensive training for faster pace and endurance training. Plus, over the November-December period, ahead of SCMM in January, he ensured that he was logging higher weekly mileage. Interestingly, Bobby said that he was not planning a random sub-three, anywhere. He was clear – he didn’t want it during any of the races of 2016 following the 2016 SCMM; he wanted it at the 2017 SCMM. So the goal was to peak by then. Preparations hit a major obstacle in October 2016, when he fell from his bicycle and fractured his arm. A runner may be running on his legs but as any runner would tell you, the movement of one’s arms is an integral part of running. The incident meant, three weeks of training lost. To Bobby’s credit, he maintained his focus and positivity. “ I let nothing shake my positivity. I maintained it through my preparations, including the time lost to fracture. I always told myself I am going to do a sub-three,’’ he said. 2017 SCMM as target – that goal never wavered. At a full marathon in Coorg essayed before the Mumbai run, he completed the course in a relaxed 3:20. On race day at SCMM, conditions were less than ideal with a pleasant Mumbai transforming on the eve of the 2017 SCMM into a sultry, warm ambiance. Minutes into the race, it took a toll on many runners. Bobby didn’t let the weather affect him. “ It was challenging but I had only one goal in mind,’’ he said. As he put it, there is one’s goal and there is one’s focus. The latter dwells on the self. 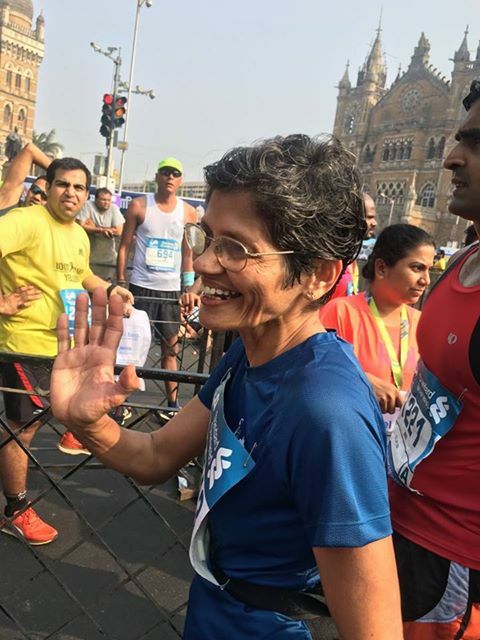 Trained well, gaze glued to intended outcome, the runner’s focus smashed through the three hour-barrier to leave the benchmark high for participants in SCMM’s 50-55 year age category. What next? – We asked Bobby. The pattern going ahead is no different from post-2016 SCMM. Maintain, improve. “ Maintaining 2:58 will be challenging enough,’’ Bobby said. And did sub-three, mean greater exhaustion and longer recovery? “ No, I always give my best at SCMM. There is soreness afterwards and a period of time taken to recover. This time too, it is no different, it’s just the same as before,’’ he said. 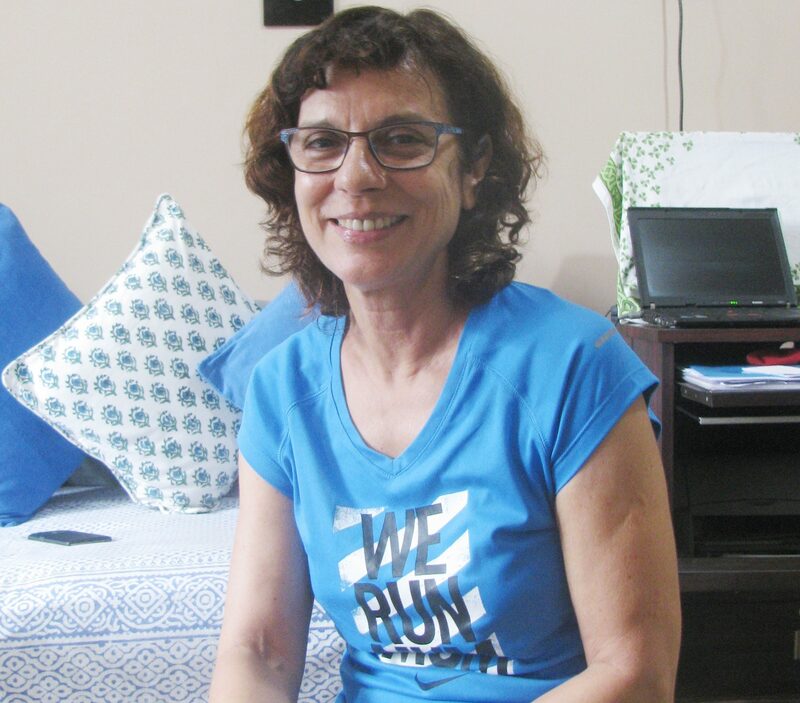 Pervin Batliwala: A veteran of many SCMMs and a podium finisher several times at the event, Pervin topped her age category (60 to 64 years) in the full marathon at the 2017 SCMM. However, she isn’t quite happy with the outcome. “ I was disappointed with my performance. I finished in 4:28:46. The weather was bad but I can’t blame the weather. I could not keep pace and also cramped a bit on the Peddar Road hill. I was expected to keep my pace at 5:55 but I could not manage that. My timing was not up to my expectation and did not match up to my training. Nevertheless, I did end as a winner in my age category,’’ she said. Her top priority now is the 2017 Boston Marathon. “I am set for Boston Marathon. I just need to keep up the momentum of training. I have been told that Boston is a tough route, especially the second half of the route. I will be participating in the Thane Hiranandani Half Marathon in February but I plan to take it easy. I won’t go all out there,’’ she said. Team Ladakh: Since 2013, Leh based-Rimo Expeditions has been sending a team of young Ladakhi runners to SCMM. Four years later and with the help of training availed from Mumbai based-coach, Savio D’ Souza, the team has produced results. For 2017 SCMM, based on their earlier performance at the event, two Ladakhi runners – Jigmet Dolma and Tsetan Dolkar – were included in the elite segment of the women’s full marathon. In the final result Jigmet ended third in the Indian elite category for women with a timing of 3:14:38. Tsetan was close behind, finishing the run in 3:14:42. “ We were together right from the start,’’ Tsetan said. The weather having unexpectedly turned warm, they stayed cool pouring water on their head. At around 25 km, they had some snacks before continuing together again. The gap between the two apparently opened up in the last 300-400m of the race, which Jigmet said, she sprinted. Close finishes – one following the other – seem habitual for these two Ladakhi runners as you see the pattern repeated at some of the other races they participate in too. In addition to the fine performance by Jigmet and Tsetan, Disket Dolma finished third in the open category of the women’s half marathon with a timing of 1:41:43. In all 11 runners came for the 2017 SCMM as part of the Rimo-sponsored team. Their current outing is as yet, the longest since the project of grooming a clutch of distance runners from Ladakh started with that visit to Mumbai in 2013. To put things in perspective: after the 2016 SCMM, the team left for Leh in February that year. Although cold, they said that they could manage short runs in Ladakh, in March. Training for the Ladakh Marathon (organized by Rimo) commenced in April 2016. Savio’s training schedule for the team, Jigmet and Tsetan said, underwent some change with emphasis on mileage. The previous schedule had focused on getting them into the scheme of training. Rimo uses the Leh Marathon results to decide each year’s team for the trip to Mumbai for SCMM. The top three Ladakhi runners in each category get selected. The Ladakh Marathon happens in September. The journey to the 2017 SCMM commenced in October 2016 with four runners leaving Leh for Delhi where they participated in a marathon in Gurgaon. From Delhi the quartet moved to Darjeeling where they stayed a month and practised hill-running. Darjeeling was chosen because while hilly, its temperature isn’t as cold as Leh’s allowing for more training time. The four runners then returned to Delhi where seven more runners joined them and the 11 strong-team, traveled to Mumbai. However, participating at the 2016 Vasai Virar Mayor’s Marathon (VVMM), they suffered a setback. According to Jigmet and Tsetan, the four Ladakhi runners who participated, received their bibs only the morning of the race. There weren’t enough safety pins for all. Three of them ran with bib clutched in their hand. Tsetan finished first in her category in the full marathon; Jigmet came second. Prizes were distributed, they said. But there was protest by other runners over the run without bibs pinned on, following which the prizes were taken back. Both Jigmet and Tsetan said that they liked the ambiance at VVMM, well known for the crowds that line up to cheer. “ We would like to come back and run it again,’’ Tsetan said. With SCMM done, the team’s attention is on the upcoming half marathon in Thane. Their last engagement will be the IDBI Half Marathon in Delhi, after which, they should be back in Leh by around the first week of March. Kamlya Bhagat: Although living near the Mumbai-Navi Mumbai region, Kamlya had never participated in SCMM. That was until 2016. That year, he ran his first SCMM and ended up first in his age category in the half marathon. In 2017, he ran his second SCMM and ended up first for a second time in his age category (30 years to less than 35 years) in the half marathon. January 18, two days after SCMM, we were back at Panvel’s Visava Hotel for a chat, missal pav and tea. Hailing from financially challenged circumstances, Kamlya races mostly on short distances at events in Raigad. Well-wishers and sponsors in Mumbai’s running community point out races elsewhere and register him for a 21 km-half marathon. Given that is how major half marathons materialize for him, in the time between his first win at SCMM and the 2017 edition of the race, the bulk of Kamlya’s running was over smaller distances. Closer to the event, according to Kamlya, Dnyaneshwar Tidke put him in touch with the folks at Nike (the coach there is Daniel Vaz). They provided Kamlya a training schedule. He couldn’t travel to Nike’s training sessions in Mumbai city; so he trained on his own near Panvel. It was already December when Kamlya began his training for SCMM. “ I must have trained for a fortnight at best,’’ he said. His schedule emphasized speed training. The short duration of training he somehow managed compared to, much of Mumbai that makes a year-long affair of Mission SCMM, wasn’t the only quirk in his preparations. On race day, minutes before the half marathon commenced, one saw him engaged in warm-up jogs. He wore no shoes; he had on just a pair of socks. According to Kamlya, while he wears shoes for his training runs, for some reason, he can’t extract race winning performance from them on race day. So at races, he prefers to go barefoot. Barefoot however, doesn’t work well on all Indian roads. He sought an intermediate situation and that is how the socks debuted. In a version of minimalist footwear he innovated, he started to wear the socks over a plain insole. But that wasn’t satisfactory as the insole tended to slide and slip around. Early January 15, with minutes left for the SCMM half marathon to begin, he was into version two of his innovation – he created a contraption wherein he first wore a pair of socks and glued the insole into place under it, then he wore two pairs of socks over it; this was his race footwear. In that, Kamlya ran to an early lead in the half marathon. Past the 17 km-mark, he recalls feeling some tiredness; he also experienced mild cramps. But he maintained his lead to end first in his age category with a timing of 1:16:11. Was he nervous defending his first position from the past? “ No, that was never a source of tension. My only worry was – I had promised those who sponsored me in registering for the race that I would try to return a timing of 1:15. Unfortunately, although I won, that timing stayed elusive,’’ he said. When this blog first wrote about Kamlya, he was staying in a hut of a home at a small hamlet on the outskirts of Panvel. He has since spent money improving his home, giving it better shape and stronger build. The money for this came mostly from running; a mix of funds contributed by fellow runners – particularly many at Mumbai Road Runners (MRR) – and prize money. “ There is still work left to do. But once the house is complete, I plan to name it: Road Runner,’’ Kamlya said. Idris Mohamed: When Idris Mohamed first ran at SCMM, he chose the full marathon. At his subsequent appearances in 2016 and 2017, he opted for the half marathon. An intriguing set of choices, Idris explained that it is both temporary and reflecting his predicament in prize money-based racing. Idris has investments, one of which is an investment in an optical business, where his partner manages the show leaving runner free to compete and more importantly – maintain a second line of earnings through prize money. It so happens that in prize money’s calendar of events, half marathons seem to exceed full marathons in India. Idris’s schedule reflects this. He came from running a series of half marathons to SCMM. By the second weekend following SCMM he was due to sail into a schedule of four half marathons. “ I cannot ignore these half marathons,’’ Idris said. As he did in Bengaluru last year, he could have run the full marathon on the back of a series of half marathons done (Idris is a triathlete and has adequate endurance to cover the additional distance of running involved) and even attempted a good timing (he had finished the Bengaluru full marathon in 3:04). But recovery in time for the half marathons following SCMM would have been tough. So he decided to stay with the half marathon at the 2017 SCMM too. He finished second in the half marathon in his age category of 45 years to less than 50 with a timing of 1:24:52. This was 28 seconds slower than the timing he registered in 2016. One reason for this was that he wasn’t feeling all that well going into the run. The sultry weather didn’t bother him. He however wished there had been some more aid stations stocked with oral rehydration solutions and energy drinks. “ Next year, I plan to do the full marathon at SCMM. Before I turn 50 years old, I want to do one,’’ he said. 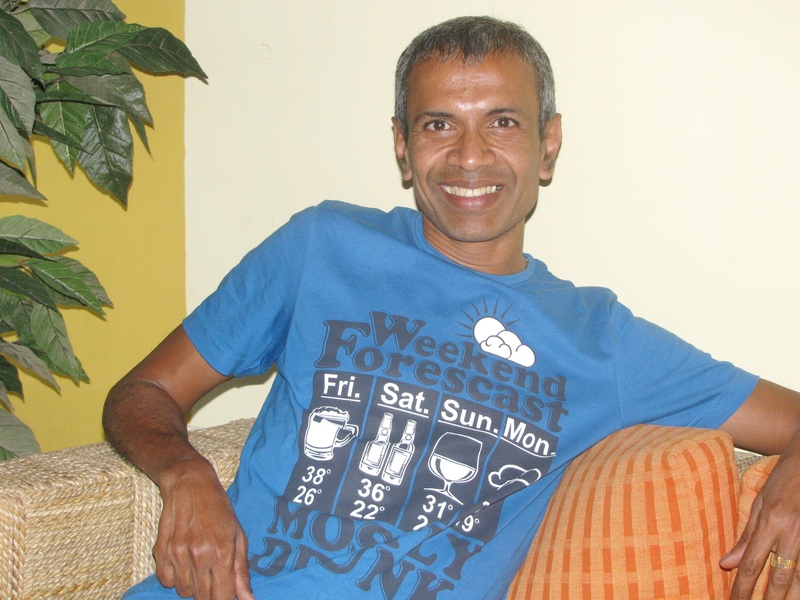 Ravi Kalsi: “ I like to run SCMM. I enjoy the spirit,’’ Ravi, who works with a BPO, said. On a warm, sultry day – not exactly ideal conditions for running – he managed both personal best timing and place on the podium. Ravi finished third in the half marathon in the 45 years to less than 50, age category. “ The run was good as I ended with a personal best of 1:25:29. I did a barefoot-run again. The road was very good till Marine Drive. My plan was to get to sub 1:25 because that meant I would be in the A category of the half marathon. I could not achieve that but I am happy with my performance. There is always a next time,’’ he said. Ravi had trained well for the 2017 SCMM. Unexpected element was the weather which suddenly changed from fine weather, ideal for running to warm and sultry, the night before SCMM commenced. “ The weather was a dampener and I realized it in the second or third kilometer itself. After about seven or eight kilometers I started pouring water on my head to help me cool down; I did so every two kilometers or so,’’ he said adding, “I like to run SCMM. I enjoy the spirit. There is so much positivity and energy. After I finished my run, I rushed to Marine Drive to cheer other runners.’’ Ravi will soon be back to training. He plans to do the ILFS 10 k coming up in February. His stringent training schedule also includes emphasis on form, diet and rest. He started running in 2011 and has done a couple of marathons. But now his focus is on improving speed and efficiency in half marathons. 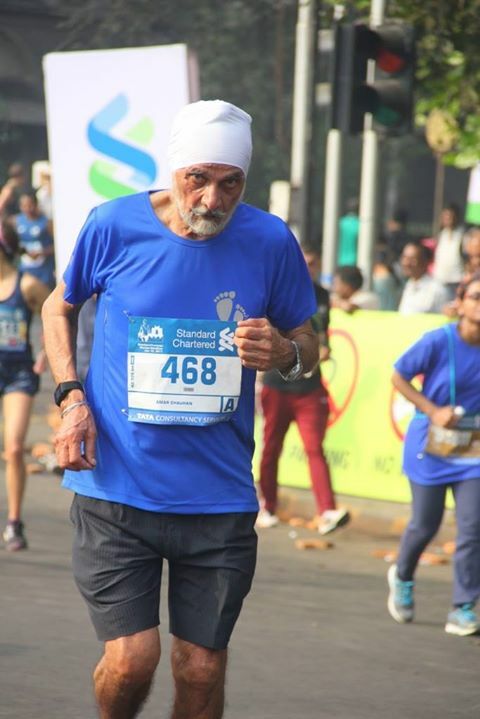 Shyam Sunder: The septuagenarian who gifted himself a marathon overseas when he turned 70 years old some time back, finished second in the 70 years to less than 75 age category of the 2017 SCMM full marathon. “ The race was good until around 30 kilometers or so. After that I got cramps and had to resort to a mix of walking and running. I did 21 km in 2:06 and 30 km in 3 hours. I was doing well until I started to get cramps at around 30km-mark. I had not trained much this time. All my long runs were below 20 km. I did not want to strain much. I enjoy running SCMM. I have no complaints at all,’’ he said. 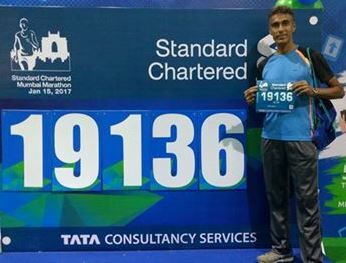 Shyam Sunder finished the run in 4:53:24, knocking six seconds off his timing in last year’s Mumbai Marathon, which incidentally had been his maiden full marathon. His next plan is to do a half marathon at the Thane Hiranandani Half Marathon, mid-February. Amar Chauhan: Amar Chauhan lives for six months of the year in Mohali and the remaining six months he divides his time between the U.S. where his daughter lives and Canada where his son resides. The retired Punjab government official started running overseas about four years ago. “ I used to go for brisk walks earlier,” he said. He has participated in 21 half marathons and three full marathons and has had podium finishes in 21 of these races. He got a podium at the BMO Vancouver Marathon 2016 (second position with timing of 4:18:04). On January 15, 2017, Chauhan topped his age category (70 years to less than 75) at SCMM. “ It was a good run. I was satisfied with my performance (4:16:31) though it was not as good as it was last year (4:10:36). I ended up first once again. This time around I developed cramps at 38 kilometers and had to take a minute’s break. But when I restarted I was fine. I had trained very well this time. Every alternative day I ran a 20 k in the month before the marathon. My long runs would be of the distance of 30, 35 and 40 km,’’ he said. About 35 runners from Chandigarh participated in the 2017 SCMM. 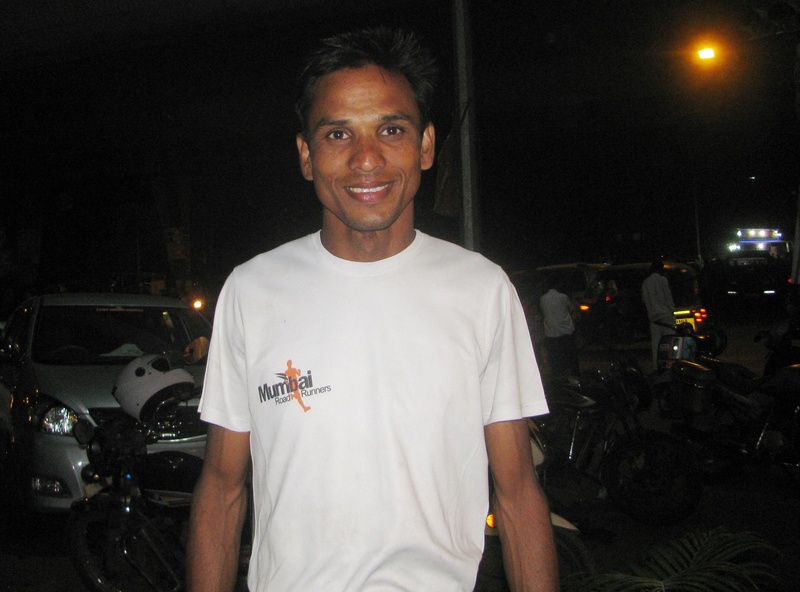 Amar Chauhan said that he likes running SCMM as there is a lot of enthusiasm, cheering and good support for runners. His next two runs are in Mohali and Chandigarh. He has already signed up for races in Canada and the US. 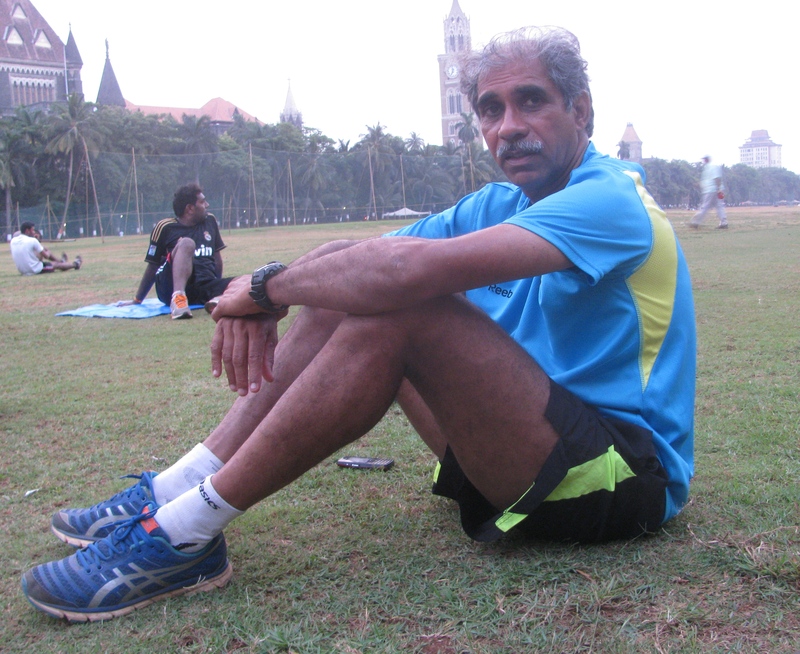 Savio D’Souza: Savio is among Mumbai’s best known coaches. A former national marathon champion he makes it a point to participate in SCMM. He finished second in his age category of 60 years to less than 65, in the half marathon at the 2017 edition of the event. “ It was a good run. I finished with a timing of 1:38 and ended up second in my age category (60-64). I was targeting 1:35 but could not manage that. Humidity was a bit high,’’ he said. Savio is also coach to the team of runners from Ladakh who have been regularly visiting Mumbai for SCMM. Based on past performance, in 2017, two of these runners were elevated to the elite category. “ As a coach it was a satisfying experience. Many of my wards ended up with places on podium. The performance of the team from Ladakh was good. This was a major race for them as elite athletes. They ran well, they did not get intimidated by anything and handled the pressure well. They have the potential to do better and improve their performance as they are quite young. They came here one month ahead of the race to get acclimatized to Mumbai’s humid weather. They have years ahead of them as marathon runners usually peak at the age of 28-32 years. I have been training them for the last two years. Many of my wards in amateur groups also ended up with podium finishes. Among them are Disket Dolma in the open half marathon category for women, Ankita Mittal and Neha Grover in the 30-34 age group of the half marathon, Vidhi Sheth in the below 35 years age group in the full marathon, Sanjay Jadhav in the 55-60 years age group of the half marathon, Elsie Nanji in the 60-64 years age group of the half marathon and Pervin Batliwala in the 60-64 years age group of the full marathon,’’ he said. According to him, SCMM is a very well organized event, one that has mobilized the entire country into running. “ It is evident in the number of people coming into marathon running,’’ he said. Vaijayanti Ingawale: A podium finisher at many of her half marathon appearances, Vaijayanti Ingawale ended up with a third position in her maiden full marathon attempt at the 2017 edition of SCMM. “I really had no clue how this run would go as it was my first full marathon. I had no target,’’ she said, noting alongside that one of the differences between the half marathon and the full is how some of the cheering and support dies out by the time the amateur full marathon runners straggle in to complete the distance. But there are exceptions. “ In many places residents were offering snacks and hydration to runners. One of the residents ran along with me for quite a distance offering me chocolate. The weather was a dampener this time,’’ Vaijayanti said. A medical doctor (she is a pediatrician), she started running in 2012 when a friend suggested that she try something new – she chose running. The bug caught on and soon she found herself signing on for the 2013 edition of the Thane Hiranandani half marathon. Later that year she got her first podium at the Goa River Marathon. She wasn’t aware of her podium status until she got home a few days later. A resident of Thane, Vaijayanti loves to travel to running events. Her husband Deepak Ingawale is also a runner. Recently, she participated in the Nilgiris run where she did a 25 k. Having crossed the finish line of a full marathon at SCMM, Vaijayanti now wants to explore ultra-distances. She is not a fan of SCMM as it is very crowded with runners now. She was also tad surprised at the lack of hydration support at the end of the run. “Further, the post-run refreshment that is offered is not up to the mark. However, the camaraderie among runners makes up for the shortcomings. It was also great to see the elite athletes running past us at such a close distance,” she said. 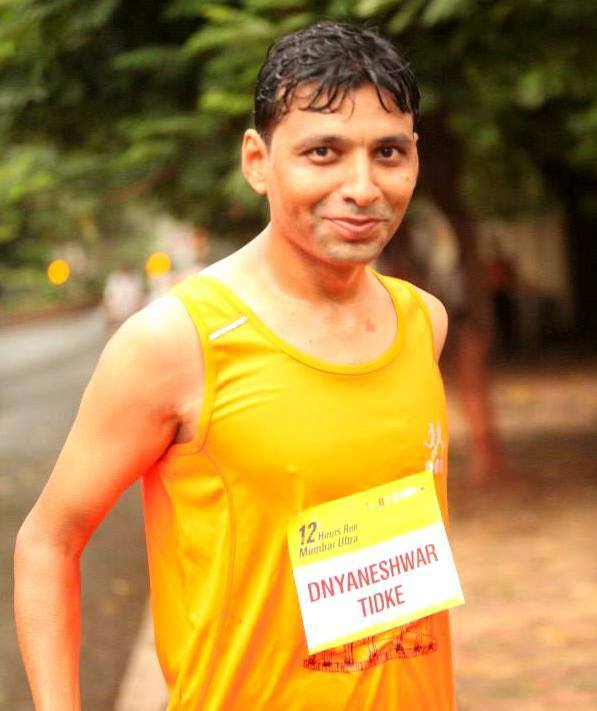 Dnyaneshwar Tidke: Among the best amateur runners in the Mumbai-Navi Mumbai region, Dnyaneshwar’s aim was to get a personal best at the 2017 SCMM. The marathon ended well for him as he finished with an officially recorded net timing of 2:55:14. 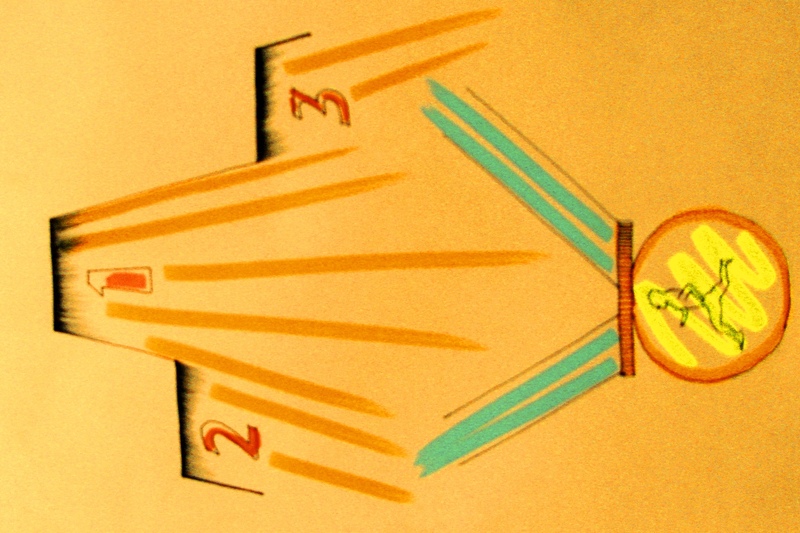 However, it fell short of his best, which remains 2:53. “I had some stomach issues, which impeded my run. But overall the run was good. This time around support was excellent with adequate water and electrolyte, sponges and oranges,’’ he said. 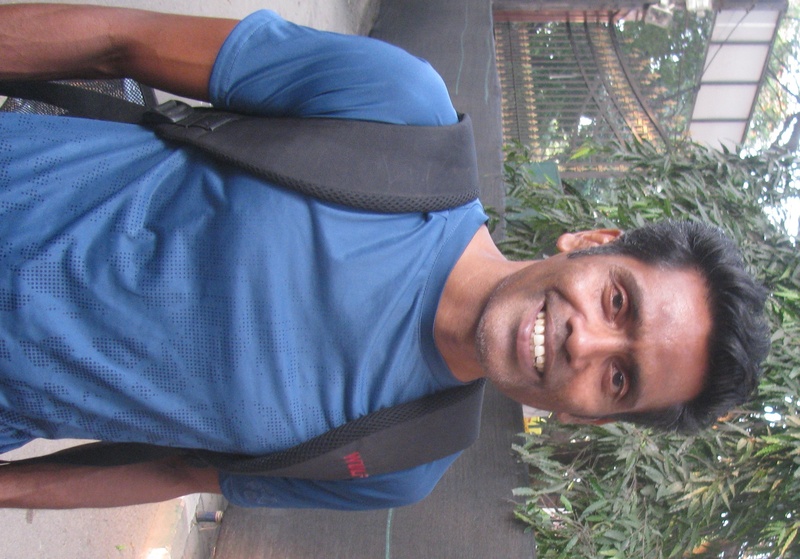 Unlike many runners at SCMM, Dnyaneshwar was not impacted by the humid weather. A major dampener for him was running into a wall of half marathon runners, particularly on Peddar Road and towards the end. Unfortunately, Dnyaneshwar did not figure among podium finishers initially although his timing within his age group indicated that he finished third. “I have written to the organizers to rectify it,’’ he said. The error has since been rectified and his podium finish is now official. Dnyaneshwar loves the energy at SCMM. His plan going forward is to focus on training and strengthening and bring down his timing.